As amateur astronomers we tend to have a schizophrenic relationship with our nearest celestial neighbour : our own Moon. Some among us even consider the Moon to be a source of light pollution that degrades our views of faint deep sky galaxies and nebulae. Others like to observe the Moon’s surface, following the passage of the shadows that emphasise the definition of many of its most interesting features ranging from impact craters to valleys and cliffs. However, we tend to treat the Moon as a collection of curios, or worse, as a catalogue : a collection of stuff to be observed and checked off on a list of items whose origins we may not understand. There are many publications available to guide us on our exploration of the Moon. Personally, I started with Ernest Cherrington’s “Exploring the Moon”, first published in 1969. I was late in discovering Antonin Rükl’s “Atlas of the Moon” in its 2004 updated version. It’s a magnificent road map to all things lunar : but that’s all it is. It will guide you geographically, but doesn’t explain what you’re looking at. Even the RASC’s Williamson Lunar Observing Program, despite it’s geological introduction, still takes a “Find - Observe - Name” catalogue-style approach to the Moon. I think that the best Moon books available today are still planetary geologist Chuck Wood’s “The Modern Moon”, published in 2003, and the “Kaguya Lunar Atlas” that he co-authored in 2011. These books are not so much Atlases : they are more an investigation of what’s been going on with the lunar surface for the past ~4.5 Ga, with an emphasis on interpretation and understanding of process : geological process. So when the RASC National discussion group was recently all abuzz with news of Chuck Wood’s latest offering entitled “21st Century Atlas of the Moon”, I sent in my order. The most attractive aspect about this new Atlas was that it was announced as based upon the spectacularly high resolution imagery that NASA’s Lunar Reconnaissance Orbiter (LRO) is still sending images back from the Moon on a daily basis. I was disappointed ! Don’t get me wrong : this is indeed an excellent Atlas of lunar features that amateur astronomers can seek out from their back yards. However, the LRO photos are the ones used as broad scale locator images for navigation, while the detailed images to guide observation are mostly taken from older missions with lower resolution than that which the LRO camera is capable of. So I asked myself, what do I expect of a truly 21st Century Atlas of the Moon ? I think it should be something that utilises all the tools available to amateur astronomers today in order to help them better understand what they are observing through their own back-yard telescopes. What do you imagine the lunar surface looks like if you were actually standing on it ? Most would reply : very dusty. What do you imagine the interior of a small impact crater looks like if you were actually standing in it ? Most would reply : smooth. What do you imagine the central peak of a complex impact crater looks like if you were actually standing next to it ? Most would reply : a mountain of solid rock. The detailed LRO images, publicly available on the web would show us that – even if we can’t see the sort of detail that LRO can – our perception of what we think we’re seeing through our own telescopes is commonly wide of the mark. What I’m going to do here is present a selection of detailed, high resolution LRO images to give you a taste of what they show, and how they will positively impact on your own lunar observing experience and understanding. 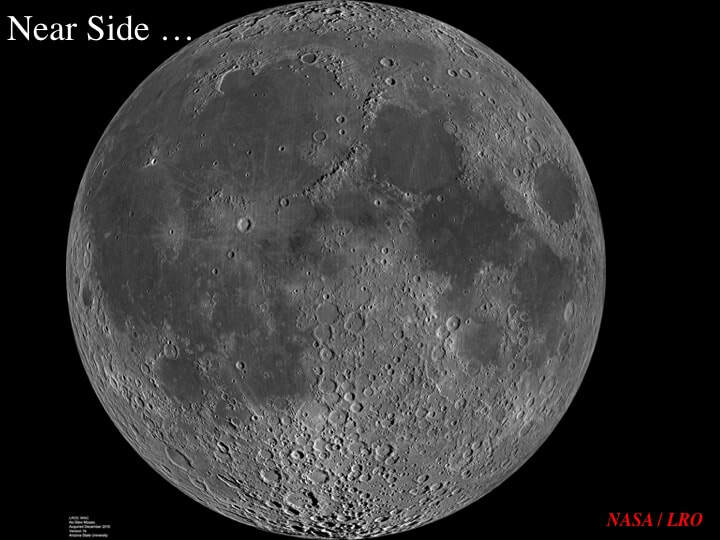 Each slide will have a lunar location inset to help you place where we are looking - as well as its URL, so you can find it n the extensive LRO public archive. Here’s the central peak in Aristarchus Crater. It is indeed made of solid rock. In fact, you can clearly make out steeply dipping compositional layering in the peak … as well as in the terraced crater wall. But, here’s part of the central peak in Tycho Crater … and it looks pretty rubbly (note the scale bar). Notice also the 130m long boulder sitting on top of the peak at this location. Here’s the summit of the central peak of Bullialdus Crater … and this is just a pile of rubbly boulders. But what’s the smooth stuff surrounding it and sitting on part of the rubble? Is it really dust ? Here’s a clue on the floor of the small crater Linné F (note the scale bar). A central mound is surrounded by a smooth moat of impact melt : a continuous sheet of molten rock generated by the heat of the impact that formed the crater and which fell back into the crater cavity and pooled on the crater floor. How do the NASA scientists know this smooth stuff is impact melt and not dust ? Here’s a sheet of the smooth stuff on the lip of the Crater Olcott (crater toward the top) on the Far Side of the Moon (note the locator inset convention). Note the lobes of smooth stuff along the crater rim - and note the longue of smooth stuff in the lower part of the image : this is melt and it flowed. Here’s a sheet of impact melt on the floor of Thales Crater at the base of the crater wall (crater floor toward the upper right). Notice the house-size boulders sitting on the impact melt closer to the base of the crater wall – and their absence further to the right. Also note the squiggly channels running over the surface of the smooth impact melt. We’ll come back to boulders in a minute … meanwhile, let’s look at channeled impact melt. Here are branching fingers of impact melt flowing over a bouldery surface, just adjacent to Grotrian Crater. Note the scale bar : this is a detailed image. At the same scale as the previous image, this is a single channeled flow of impact melt near the Crater Ingalis. Note the details : the flow is flanked by boulders up to 10+m across that the flowing melt has pushed to one side - and there are multiple lobes at the termination of the flow, indicating multiple pulses of flow. This example of channeled impact melt flow from Lowell Crater nicely illustrates the concept of a second pulse of melt flow, either on top of – or within – the older flow, and breaking through the old termination to form a new lobe. However, not all that flows is melt ! At the same scale as the previous images of impact melt flow, this is a granular flow of sandy to gravelly debris running down the side of Pytheas Crater, where we also see layering related to mare basalts : more on mare basalts later. Remember – this is a dry flow : there’s no water involved here ! Within the small crater Clavius E we see this remarkable example of fine grained debris that has flowed in a channel over the top of older, locally bouldery debris, down to a terminal front at the lower right. This is not easy to distinguish from an impact melt flow ! The walls of Gardner Crater are plastered here by multiple, braided fine grained debris flows that appear to cover older, coarser grained debris flows. This house-sized boulder has bounced it’s way down the slope of the central peak of Schiller Crater. Need I say more ? These curved trails down the wall of Pikel’ner Crater show that these boulders rolled, without bouncing. … and this 10+m bouncer ran down the wall of Henry Frères Crater and pulled off a hole-in-one into a pre-existing pit in the crater floor ! Boulders are everywhere on the Moon. Remember my question about what the interior of small craters looked like ? This one, near Reiner Gamma, has a central pond of impact melt - and is absolutely blanketed with boulders that fell back from its impact ejecta. Personally, I had simply assumed that ejecta rays - the bright streaks we see radiating from impact craters like Tycho – were made of dust, until I saw this image of an ejecta ray from a crater within the Mare Moscoviense on the lunar Far Side. What did you think they were made of … ? ​OK : let’s now turn to lunar volcanism, starting with the mare basalts that fill the ~1000 km multi-ring impact basins we see on the lunar Near Side. Here, in the wall of Bessel Crater, we see fine layers, each representing a basalt lava flow that contributed to filling the Mare Serenitatis. Look at the scale bar : each flow is maybe 20m thick - and the cavity of the Serenitatis Basin was likely about 10 km deep : that’s a lot of individual lava flows ! This is a 50 m wide collapse pit in the basalt flows of Mare Tranquilitatis. Look carefully – you can see rubble on the floor of the pit ! That’s high resolution ... ! Here’s a favourite of many lunar observers : Hyginus Crater and its valley segments (note the scale bar). The crater is not an impact feature : it’s a hole in the mare basalts without a raised rim. It’s a volcanic caldera – a collapsed volcanic vent. Nice, but notice the chain of collapse pits along the valley segment to the upper left : these features are related to the same volcanism too. Now lets look at the floor inside Hyginus Crater : note the dramatic change in scale. The bright features are collapse pits within the collapsed caldera floor – proof, if you will, of the volcanic origin of Hyginus Crater. This is remarkable ... ! By now we’re well aware that squiggly valleys are the erosional product of rivers of flowing volcanic lava on the lunar surface. However, until LRO, I had absolutely no idea of the existence of these exceptional examples in the vicinity of the small crater Herigonius K. I believe that the crater is about 10 km across. Here’s another favourite of lunar observers : Posidonius. But did you know that one of the most prominent “fractures” in the crater floor is in fact a 130 km long squiggly valley carved by flowing lava ? Did you know that half of it hugs the base of the crater wall ? Well now you do ! Finally, a perennial favourite of us all : Schröter’s Valley just north of Aristarchus Crater on the Aristarchus Plateau. “So what” I hear you say : been there, seen that ! Ah, but did you know that there’s a squiggly valley running all the way down Schröter’s - and that diverges from it at the western end ? Clearly the squiggly valley represents a younger event ! 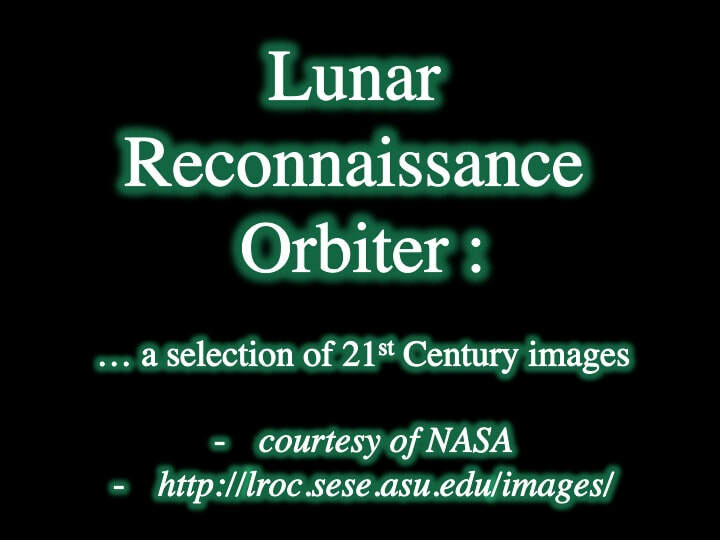 I introduced this presentation as a “taster” to what LRO has to offer us as amateur astronomers. Let me end by suggesting that LRO has in fact provided us – and continues to provide us – with a truly 21st Century Lunar Atlas that already can teach us how to better understand our nearest celestial neighbour. I would strongly encourage you to peruse the LRO resource : it will literally change the way you observe and think about what you see on the Moon’s surface through your own telescopes.